A dainty wrap selection of chicken caesar; falafel and houmous; duck and hoisin; and chicken fajita. 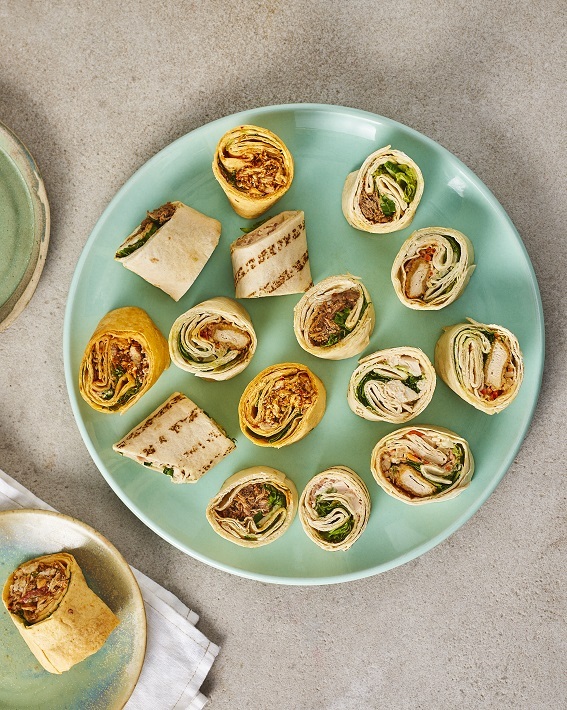 Wrap platter consisting of 4 quarters of falafel and houmous wrap, 4 quarters of chicken fajita wrap, 4 quarters of chicken Caesar wrap and 4 quarters of hoisin duck wrap. Tortilla Wrap (Fortified Wheat Flour (Wheat Flour, Calcium Carbonate, Iron, Niacin, Thiamin),Water, Palm Oil, Rapeseed Oil, Raising Agents: Sodium Hydrogen Carbonate, Disodium Diphosphate, Malic Acid; Sugar, Salt, Wheat Starch), Marinated British Duck (21%) (Duck, Muscovado Sugar, White Wine Vinegar, Granulated Sugar, Soy Sauce (Water, Soy Bean (Soya), Wheat, Salt), Five Spice (Star Anise, Cinnamon, Fennel, Peppercorn, Clove), Sea Salt, Cornflour, White Pepper), Hoisin Sauce (12%) (Water, Sugar, Hoisin Sauce (Water, Black Eye Beans (Black Eye Beans, Water, Salt), Soy Sauce (Water, Salt, Soya Bean, Wheat Flour), Sugar, Black Treacle (Molasses, Invert Sugar Syrup), Red Wine Vinegar, Sunflower Oil, Red Chillies, Cornflour, Salt, Chinese Five Spice (Cassia, Coriander, Fennel, Ginger, Aniseed) Szechuan Pepper), Brown Sugar, Tomato Paste, Light Soy Sauce (Soy Extract (Water, Soya Bean, Salt, Fortified Wheat Flour (Wheat Flour, Calcium Carbonate, Iron, Niacin, Thiamin), Sugar, Salt,Water, Acidity Regulator: Acetic Acid), Cornflour, Fermented Yellow Beans (Soya Beans, Water, Salt, Fortified Wheat Flour (Wheat Flour, Calcium Carbonate, Iron, Niacin, Thiamin)), Rapeseed Oil, Five Spice (Cinnamon, Star Anise, Rice Flour, Fennel, Cloves, Black Pepper), Salt, Ginger Puree, Red Chilli Puree), Lettuce (10%), Cucumber (9%), Spring Onion (4%), Water, Coriander, Cornflour. Chilli Tortilla Wrap (Fortified Wheat Flour (Wheat Flour, Calcium Carbonate, Iron, Niacin, Thiamin),Water, Palm Oil, Rapeseed Oil, Chilli Seasoning, Raising Agents: Sodium Hydrogen Carbonate, Disodium Diphosphate, Malic Acid; Sugar, Salt, Onion Powder, Red Pepper, Garlic Powder, Cumin, Colour: Paprika Extract; Oregano, Capsicum, Garlic), Fajita Style Chicken (19%) (British Chicken Breast, Chilli Powder, Salt, Sugar, Spices (Cumin, Coriander, Paprika, Cinnamon), Coriander Leaf, Oregano, Red Pepper, Onion Powder, Garlic Powder, Smoked Salt, Citric Acid, Lemon, Rapeseed Oil, Cornflour, Natural Flavouring (Lime Oil, Chilli)), Salsa (11%) (Tomato,Water, Sugar, Red Wine Vinegar, Tomato Puree, Spirit Vinegar, Green Pepper, Cornflour, Mustard Seed, Cayenne Pepper, Onion Powder, Black Pepper), Sour Cream (Cows' Milk) (6%), Lettuce (6%), Monterey Jack Cheese (4%) (Cows' Milk), Tomato (4%), Creme Fraiche (Cows' Milk), Onion (2.5%), Spring Onion, Coriander, Cornflour. Wheat Flour Tortilla Wrap (Fortified Wheat Flour (Wheat Flour, Calcium Carbonate, Iron, Niacin, Thiamin),Water, PalmOil, Raising Agents: Sodium Hydrogen Carbonate, Disodium Diphosphate; Rapeseed Oil, Sugar, Salt, Malic Acid, Wheat Starch), Falafel (16%) (Water, Chickpeas, Onion, Rapeseed Oil, Fortified Wheat Flour (Wheat Flour, CalciumCarbonate, Iron, Niacin, Thiamin), Raising Agent: Calcium Phosphate, Sodium Hydrogen Carbonate, Ammonium Hydrogen Carbonate; Parsley, Dried Onion, Salt, Rice Starch, Sugar, Coriander Leaf, Coriander Powder, Cumin Powder, Garlic Puree, Black Pepper), Houmous (12%) (Water, Chickpeas, Tahini Paste (Sesame), Concentrated Lemon Juice, Rapeseed Oil, Garlic, Cornflour, Salt), Red Pepper, Cucumber, Moroccan Style Chutney (5%) (WhiteWine Vinegar, Sugar, Red Pepper, Tomato, Apples, Water, Onion, Salt, Garlic Powder, Mint, Coriander Powder, Ginger Powder, Cumin Powder, Chilli), Carrot, Spinach, Water, Rapeseed Oil, Mint, Cornflour, Sugar, Spirit Vinegar, Citrus Fibre, Stabiliser: Pea Protein, Dextrose Powder; Salt, Lemon Juice, Brown Mustard Seeds. Tortilla Wrap (Fortified Wheat Flour (Wheat Flour, Calcium Carbonate, Iron, Niacin, Thiamin),Water, Palm Oil, Raising Agents: Sodium Hydrogen Carbonate, Disodium Diphosphate, Malic Acid; Rapeseed Oil, Sugar, Salt, Wheat Starch), Chicken (19%) (British Chicken Breast, British Chicken Thigh, Cornflour, Salt), Caesar Mayonnaise (15%) (Water, Rapeseed Oil, Garlic Puree, Pasteurised Free Range Egg Yolk, Sugar, Citrus Fibre, Cornflour, Concentrated Lemon Juice, Salt, Thickener: Pectin; Parmigiano Reggiano Cheese (Unpasteurised Cows' Milk), White Wine Vinegar, Chives, Red Wine Vinegar, Mustard Seeds, Parsley, Spirit Vinegar, Black Pepper, Anchovy (Engraulis anchoita, Engraulis encrasicolus) (Fish), Sunflower Oil, Cheese Powder (Cows' Milk), Glucose Syrup, Yeast Extract, Yeast, Maltodextrin), Cucumber, Cos Lettuce, Maple Cured Smoked Streaky Bacon (4.5%) (British Pork Belly, Maple Syrup, Salt, Sugar, Antioxidant: Sodium Ascorbate; Preservative: Sodium Nitrite), Grana Padano Cheese (Unpasteurised Cows' Milk, Preservative: Lysozyme (Egg)), Cornflour. Safety: Although every care has been taken to remove all bones, some may remain. Grana Padano cheese and Parmiagiano Reggiano Cheese made with unpasteurised milk. Expectant mothers and those susceptible to infection should avoid eating this cheese.